There are books that warm the soul. There are books that you know will have that effect on you. 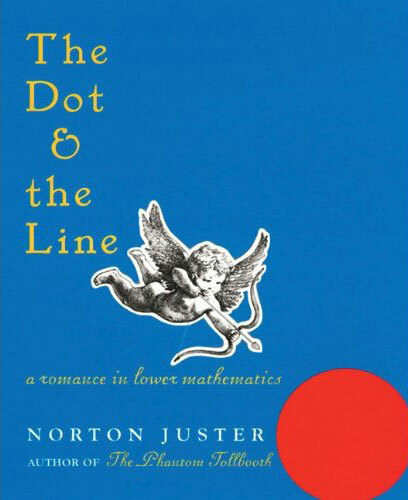 “The Dot and the Line” by Norton Juster is one such book. A friend recommended it to me and I borrowed her copy and could not stop gushing about it. It is a book that will make you chuckle, will make you want to cheer for the line and will make you want to go to your loved one and say, “I Love You” over and over again. When such books come along, you just read them and reread them and reread some more. “The Dot and the Line” as the title suggests is about a dot and a line. It is about a line who loves a dot who loves a squiggle and does not think much of the line. The line tries hard but fails and that’s when he decides to change and something unexpected comes out of it. The illustrations and the story per se are just superb. It is a book for all ages as well and not just limited to children. I think it is more for adults than anything else. There are mathematical expressions throughout the book which is so much fun to glance, infer and understand. The puns are hilarious and more than anything else the illustrations fit straight right in with the story. I don’t even know if I can place it any single genre as it deserves to be a part of so many. I am grateful to my friend for introducing me to this book. It is magical, wondrous and full of life and vitality. “The Dot and the Line” is the kind of book you must read with your better-half or loved one for the impact to be doubled. This entry was posted in Books, Chronicle Books, Love, Mathematics, Review and tagged Adults, children, Chronicle Books, Funny, humour, Love, mathematics, Norton Juster, The Dot and the Line on April 2, 2015 by thehungryreader.